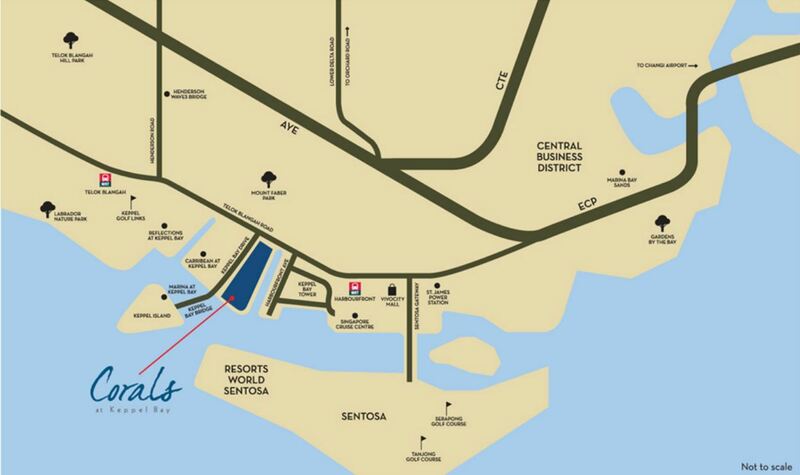 Located in the exclusive Keppel Bay precint along Singapore's vibrant southern shores. Corals at Keppel Bay offers prime waterfront living with attractions at your doorstep. Get set for a life less ordinary. Right Across from Marina at Keppel Bay, Corals at Keppel Bay offers homeowners an idyllic lifestyle in a picturesque setting. Wake up to sheer tranquility, fresh air and magnificent views. Stroll across Keppel Bay Bridge and embark on ocean adventures. Or enjoy golden moments by the water as the day gives way to night. Across Corals at Keppel Bay is Sentosa, home to Resorts World Sentosa, Universal Studio Singapore and many other enticing recreational venues. Lose yourself in the excitement of the theme park, gaming thrills, shopping pleasure, culinary delights and more! Live connected to a plethora of urban delights, with HarbourFront MRT Station and VivoCity a stone’s throw away. Commute islandwide with absolute ease. Update your wardrobe, satisfy your palate, relax and be entertained at Singapore’s largest lifestyle mall. Discover nature in all her splendour at Mount Faber, Singapore's iconic hilltop attraction. Enjoy invigorating walks, soak in the panoramic views, or dine to the unique sight of cable cars gliding across the sky. All in the backyard of your home. Be whisked from the comfort of your home to the buzz of the Central Business District only minutes away by car and as easily reached via the MRT.Just as accessible is the famed shopping street Orchard Road, a veritable mecca fo fashion and food connoisseurs from the world over. Just as accessible is the famed shopping street Orchard Road, a veritable mecca for fashion and food connoisseurs from the world over. When night falls, pulses quicken. Revel the night away at St. James Power Station, a sprawling entertainment complex next to VivoCity. Soak in the air of la dolce vita, and chill out to some of the best live music in town.